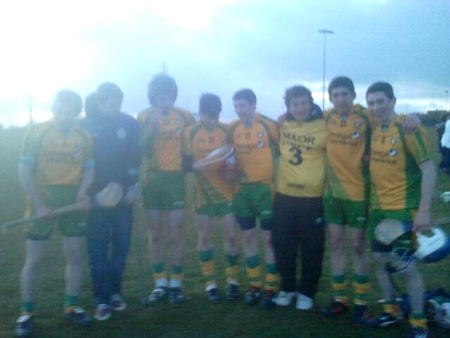 Friday night was a great night for under-age hurling in the club as we had eight lads on the Donegal minor panel who won the Ulster Shield defeating Monaghan at the Tyrone Centre of Excellence at Garvaghey. The game was played in very blustery conditions and Donegal appeared to be very nervous early on and it seemed that the favourites tag had them under pressure. It was nip and tuck throughout the first half and Donegal went in at half time leading 0-5 to 0-4. Two of the point scorers in the first half were Colm Kelly and Jamie Brennan, they were joined in the starting 15 by Tommy Gillespie and Eddie Lynch. Donegal had the aid of the strong breeze in the second half and slowly began to get on top, a pair of goals by Jamie Brennan put Donegal in a strong position but Monaghan never gave up and kept battling away. Ois�n Rooney came on as a sub and increased our representation to five on the team. He got on the score sheet with a point and Colm Kelly followed up with another point. Donegal ran out convincing winners on a 2-8 to 0-5 scoreline. Ciaran Rami and the injured pair of Eugene Drummond and Donal Sweeney completed our representation on the panel. Our large representation on the panel is a reflection on the amount of work put into under-age hurling in the club over the last few years. Seven of our representatives are under-age again next year. 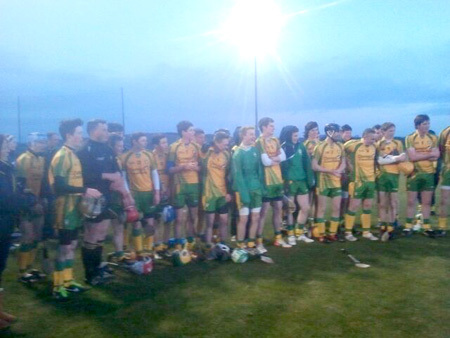 The Ulster medals are a just reward for the boys dedication to county training which began on 28th December 2012. 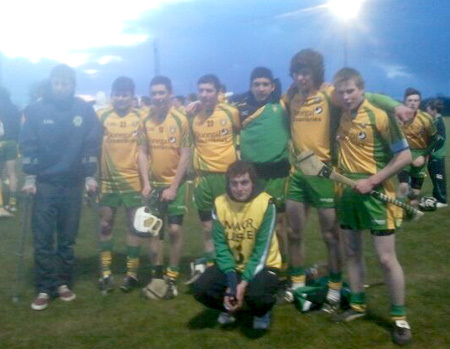 Aodh Ruadh were also represented on the night by Donegal's Children Officer Mick McGrath.